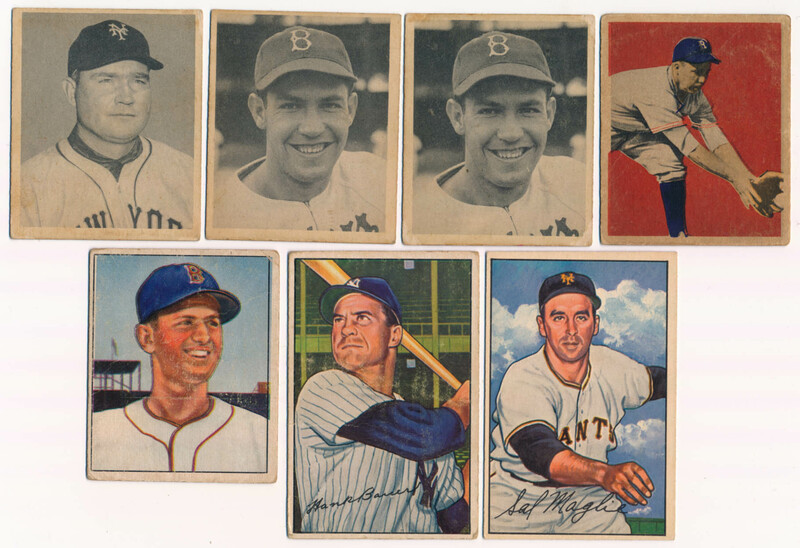 Lower grade box of Bowman baseball cards, as follows: 1948 Bowman (5 w/Mize & two Reisers), 1949 (11 w/Reese, Marion), 1950 (6 w/Parnell), 1951 (4), 1952 (55), 1953 Bowman Color (3 w/Hodges, Schoendienst), 1954 (3 w/Ford, Hodges), 1955 (57 w/Berra, Hodges, Kiner, Schoendienst & Zimmer). The condition varies extensive, it is about VG overall. Also included are some lesser reprint cards, stray 70s oddball cards & a 74 Fleer Pioneers of Baseball set. This lot should have solid breakdown value if desired.